When it comes to Data Backup, we always wonder which tool to use. Not every free tool gives us access to take 100% data backup and restore it in crucial situations. EaseUS Todo Backup Home turned out to be one of the finest tools to back and restore your data in no time. Our data is the most essential part of our computer and we can’t afford to lose it at any cost. 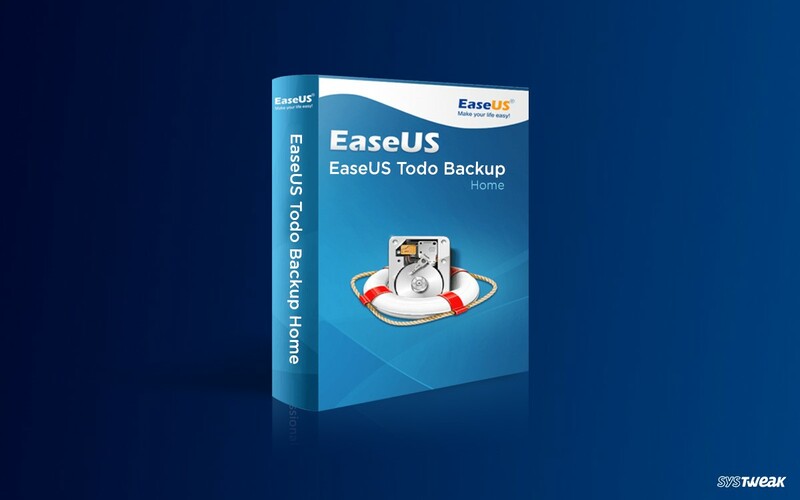 EaseUS Todo Backup Home creates a full copy of your data, all your Windows files and settings, Outlook, Favorites and applications so that it can be recovered in case of system crash. EaseUS is an international software development company established in 2004 based out of China and registered office in US with major focus on providing Data Backup and Recovery Software ensuring Data Security with best user experience. This company has built trust in more than 10 million customers and counting. They are so confident about their product that they provide you free trial software with 30-day money-back guarantee. Operating System: EaseUS Todo Backup Home is compatible with Windows 10 and earlier versions including Windows XP. It is also compatible with MAC Operating Systems. Hardware Requirements: Although there is no specific hardware requirement for this application to be used on a computer, though 1GB RAM and at least X86 and above CPU with required peripherals are must. If you want to make a bootable Disc Drive, then we should have a CD / DVD RW to solve the purpose or a USB Flash Drive may also work. Minimum 500 MHz or above processor is required to perform Data Backup or Data Recovery. Devices Supported: This tool supports all kinds of ATA SATA / ATA IDE / External SATA / SCSI HDD / SCSI, IDE and SATA RAID controllers / IEEE 1394 (FireWire) HDD / USB 1.0/2.0/3.0 HDD / RAIDed configurations. The only limitation is, it supports large capacity (GPT and MBR) hard drives up to 16TB and 32TB disks at the most. File System: This Data Backup Software supports all types of NTFS, FAT12, FAT16, FAT32 file systems. Disk Space: To install and use Data Backup and Recovery application swiftly, we should have at least 1GB of free Disk Space in our system. Backup Storage Devices – It allows you to store backups to external device, hard drive, network shared location, FTP server, NAS, DVD, etc. Ease of access to Browse Image Files – EaseUS allows you to browse backup files in Windows Explorer and copy or paste files & folders. Compatibility with GPT/UEFI – This Data Recovery Software allows you to create a WinPE bootable media for 64-bit Windows installed on GPT systems. Pre-OS Recovery Environment – In event of Operating System failure, it allows you to select Todo Backup from the Boot Menu to launch Pre-OS to recover the system. Backup Scheduling and Reporting – It gives you freedom of creating and customizing backup tasks to run on a scheduled time frame. It keeps you updated on your backups with real-time backup reports & logs, monitoring, and email notes. Flexible Backup Management – It automatically manages all backup jobs and delete outdated backup images to free up disk space. Contact Names Disappearing in WhatsApp? Here's The Fix!